The hotel Carmin in Le Havre combines design, comfort and accessibility, located in the city center, the hotel is also close to the beach (600 m). The interior design of the hotel is fun but measured, and much appreciated by our guests. Our other most enjoyed qualities are the warm welcome by professional and caring hotelier, plus the spacious and comfortable rooms. The city center of Le Havre is at your feet as you exit the Hotel Carmin: the City Hall and the shopping center René Coty are less than 5 minutes walk. The pedestrian zone of Bernardin de St Pierre is 150 m from the hotel where you will find shops, cafes, brasseries and restaurants which extends to the Covered Market. Continue up the hotel’s street for a few minutes to reach the beach, the seaside and the port. For those who wish to leave their car, parking is very easy in front of or around the property. The hotel is situated 15 minutes’ walk from the train station : leaving Le Havre train station, take Jules Lecesne street and you will be at the Hotel in less than 15 minutes walk. Or hop on the tram, the hotel is 2 tram stops away. Located in a quiet area of ​​Le Havre city center, Hotel Carmin offers a warm and personalized welcome. Our team is at your disposal to provide you a pleasant and serene stay. Result: we have many regulars! Our guests enjoy first and foremost: a charming and relaxing setting, attentive staff, impeccable services and the pleasure of a delicious breakfast. 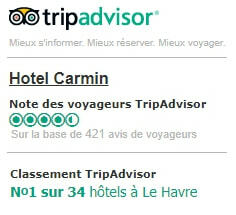 The quality of the services of our Le Havre design hotel has been recognized for many years: the 3-star Hotel Carmin is a member of the Hotel Club Havres and is also part of the Quality Tourism Charter. Each hotel room is different with regularly refreshed interior designs, keeping the hotel modern and original. Boasting an up-to-date, elegant decor, these rooms are very clean and quiet and perfectly respect hotel standards. The owners along with their team will always be at your disposal to give you advice on places to visit in the Havre such as museums, bars, restaurants. We will give you maps and tourist information when you check-in.